Learning systems thinking is best done by doing. Case studies are useful ways to understand some basic principles, and I find that it can be useful to use case studies from other sectors, especially with a mixed audience. Cases that are very specific to (some of) the participants can be problematic for learning, for a few reasons. First, they can tend to bias toward the expertise of some people in the room, putting others at a disadvantage. As an example, with a mixed group of air traffic controllers, maintenance technicians, aeronautical information specialists, meteorological specialists, an air traffic incident will often illicit much more discussion from air traffic controllers, putting the others in a disadvantaged position. This tends to close down discussion from some, leaving them disengaged. But the mix itself is – usually – advantageous. Second, participant-specific case studies can rouse particular emotions. A safety occurrence or forthcoming organisational change can bring about all kinds of upset, which can be counterproductive to initial learning. Third, specific case studies can focus attention on microscopic factual and counterfactual details, and again distract from learning. So for these and other reasons, I find that learning about systems thinking can usefully start with cases that are inclusive to all group participants, that will not bring about heated debate, and that will keep a wide focus on holism and interactions. A few weeks ago, I facilitated a workshop on systems thinking for safety investigators and safety assessors, most of whom were primarily operational or technical specialists with part-time safety-related roles. We used a case study from healthcare (which often borrows from aviation). 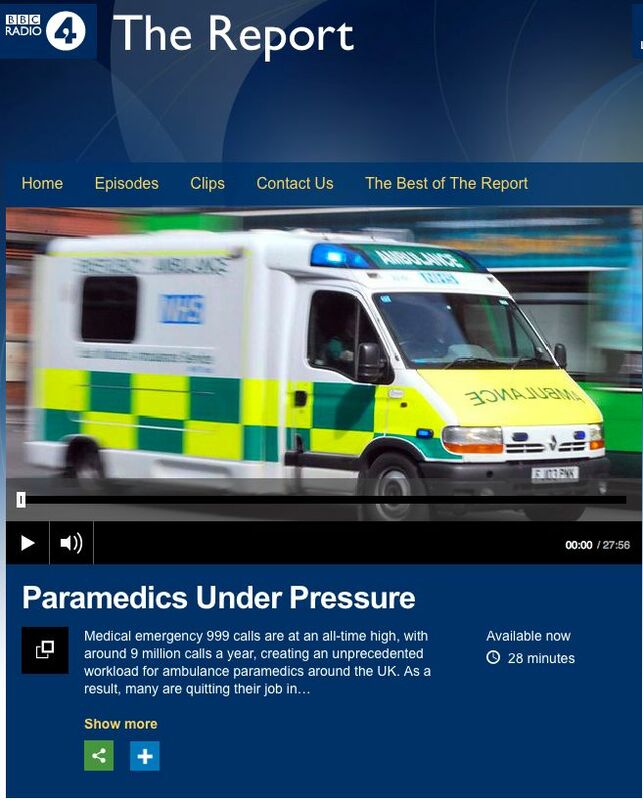 The case presented was a BBC Radio 4 podcast from the The Report, called Paramedics Under Pressure (available to listen here). Medical emergency 999 calls are at an all-time high, with around 9 million calls a year, creating an unprecedented workload for ambulance paramedics around the UK. As a result, many are quitting their job in increasing numbers, burnt out and unable to keep up with the pace of work now demanded of them. Adrian Goldberg investigates what’s behind this growing demand for emergency medical assistance, and asks why the recruitment of emergency paramedics has not kept pace with pressure on the service. Serving staff as well as those who have quit their job reveal a target-driven culture which sees them sent from job to job to job, where a lunch break is seen as a luxury. The finger is also pointed at some members of the public, who dial 999 to demand an ambulance for trivial injuries and illnesses. Senior managers working for ambulance service trusts around the country say there is no quick fix for this rising exodus of staff – especially now paramedic training requires a university degree course. This has led some trusts to look as far afield as Australia and New Zealand for new recruits to plug the gap. The NHS is planning an enhanced role for paramedics where they will be required to treat more patients in the field, to ease the pressure on over-stretched A&E departments. But with staff retention and recruitment an on-going issue for several ambulance services around the country, will they be able to meet these new expectations and will new recruits burn out too? Download the podcast (or another radio/film programme that is rich in systems concepts) onto a device (e.g. iPlayer Radio for Apple or Android or Windows phone), in case you lose internet connection and in case it disappears from the website. the transcript (or a transcript for whatever programme you are using; sometimes these are provided, otherwise DIY…). This helps to follow and recall the narrative. the Systems Thinking Learning Cards. These are available in two formats here. the A3 wheel diagram of the ten principles. sticky notes and pens to write notes on how the principles apply, and interactions. Ask participants, in one or several small groups, to discuss the case in terms of the ten principles. We preferred not to have a fixed starting point, but to allow each groups to find its own starting points to make sense of the narrative. Map the interactions between the principles onto the wheel, annotating the arrows. Discuss these interactions as a group. These might include the relationships between pressure, resources and trade-offs, for example. Note the nature and direction of the influences and interactions. The interactions may be one to many, many to many, and may link two or more principles. We found it best to best to keep group feedback discussion at the level of interactions between principles, not the individual principles. Other methods can also be used (by other groups, or in place of the Ten Principles, or subsequent to them). Some of these are listed here. Particularly useful for this particular case could be AcciMaps, Influence Diagrams, Causal Loop Diagrams, and Rich Pictures. This transcript has been produced by Steven Shorrock for learning purposes. This transcript is used in learning workshops along with the EUROCONTROL Systems Thinking for Safety: Ten Principles (A White Paper). See http://bit.ly/ST4SAFETY for more information. Adrian Goldberg investigates why rising numbers of paramedics are quitting the ambulance service [in the United Kingdom]. Adrian Goldberg: Emergency calls to the ambulance service have almost doubled in the last ten years. Anthony Marsh (Chief Executive): 999 activity [999 is the telephone number to reach emergency services] this year is the highest it’s ever been. Our front-line staff and our control room staff are working flat-out. Adrian Goldberg: And as pressure on the service grows, in many parts of the country, hard-pressed paramedics are leaving in ever-greater numbers. There is now a national shortage. We’ve been told that in London more than 200 emergency calls are sometimes put on hold. Adrian Goldberg: This week on the report, we investigate why so many front line ambulance staff are quitting, and we look at the impact it has on those who call 999. Adrian Goldberg <in an ambulance>: We’ve got the sirens blaring now and we’re weaving in and out of the traffic, just going across the River Thames now on one of the bridges in London. What are we going to? Alison Blakeley (Paramedic): We are going to a fifty year old male who’s passed out and is not alert…”Mike Delta 4-5”. Adrian Goldberg: Alison Blakeley, attending an emergency call in Central London. She’s been a paramedic delivering specialist emergency healthcare for ten years. Alison Blakeley: It honestly is one of the best jobs in the world. It’s different every day. You never know what you are going to go to. And you actually make a real difference to people. They are people that genuinely really need your help. It’s very different now to ten years ago, and that was busier than twenty years ago, and you – generally speaking – are out for your whole day, be that a ten-hour shift or a twelve-hour shift. Adrian Goldberg: But what about say, having a cup of tea and a sandwich, having a break? Alison Blakeley: Yep, so we generally go from call to call to call, so you use hospital facilities for toilets as much as possible, and eat and drink as and when you can. The control room do try and get us rest breaks, but due to the demand currently – rare, I’d say. Adrian Goldberg: So it’s rare that you would get a formal twenty minute, half an hour sit down, sandwich, cup of tea, cup of coffee? It’s rare on a working day now that you would get that? Adrian Goldberg: That must make it quite hard. I mean, you’re describing it as the best job in the world. That sounds pretty tough. Alison Blakeley: Yeah, I’d say its one of the best jobs in the world but its also an incredibly difficult job. Operator: Emergency ambulance. What’s the address of the emergency please? Adrian Goldberg: One of London’s ambulance control rooms near Waterloo station. There’s a concentrated buzz here among the phone answerers, who tell me that they too are faced with an increasing workload. Barbara’s worked here for eight years. In that time, London’s population has risen by around 400,000 people, to just under eight million. So how have call volumes changed in that time? Barbara (control room operator): Enormously. When I first started, the amount of calls that we take now in a 24-hour period is pretty much nearing on what we used to take on New Year’s Eve. So it’s a lot, a lot more. Adrian Goldberg: So every day is like New Year’s Eve now? Barbara (control room operator): Yeah, I mean only Sunday night we took 6,600 calls, for a Sunday night. And before, you used to be able to say, right, from Sunday through to, say, Wednesday, it’s fairly quiet. Can’t do that any more. You just don’t know. Adrian Goldberg: What’s your observation about what’s driving that? What has changed? Barbara (control room operator): The number of people I think in London. We’ve at not just got the people that live here, but all the people that work here that commute here, the tourists the number of people that have come to live in the country so you know now that you are not going to sitting here twiddling your thumbs, so that it is almost call after call. It is very rare now that you will have five minutes between each emergency call. Adrian Goldberg: Ten years ago there were just under five million 999 calls in England. Last year that had risen by 83% to more than nine million calls. But over the same period the number of ambulance staff has risen from around 16,000 to 18,700, an increase of only 17%. Anthony Marsh started his career on the frontline of the ambulance service as a paramedic. He is now Chief Executive of both West Midlands ambulance Trust and its counterpart in the east of England. He is also Chairman of the Association of Ambulance Chief Executives. Anthony Marsh: 999 activity this year is the highest it’s ever been. Our frontline staff and our control room staff are working flat out to get to as many patients as they possibly can as quickly as they can. Traditionally ambulance services received just over four per cent more 999 calls each year, and we have done for the past 10 years. Some a little bit more than that and some little bit less. This year we’ve seen substantially more 999 calls. That’s obviously putting a lot of pressure on our frontline staff, and this year some services are experiencing higher than average attrition [staff leaving]. That’s frontline staff predominantly paramedics and therefore the pressure on the remaining staff is greater than it’s ever been. Adrian Goldberg: London is one of the worst affected areas in the country. We’ve seen a confidential internal report prepared for the London Ambulance Service by a senior paramedic. I’m flicking through it now. And it really doesn’t make for happy reading. Three quarters of staff surveyed have thought about leaving in the next 12 months. Look, these are quotes from disgruntled staff, “Patient care is not prioritised, its just rush rush rush”; “London’s population has risen dramatically but we’ve lost staff and we can’t cope with the demand”; “I joined to help people. It was unclear to me that target times and paperwork were more important”; “The relentlessness of shifts is very hard to sustain”; “Expect more and give less”; “Working harder”; “You are unable to eat”; “Irregular shift patterns”, “Pushing staff”; “Constantly being pushed”. We’ve also spoken to staff in the East of England and the North-East of England and they tell a similar story: too many callouts, too much stress. Figures we’ve obtained from twelve of the thirteen ambulance services across the UK suggest that in the last two years the number of paramedics leaving their jobs has almost doubled. In the year to April 2012, 593 paramedics quit. Last year, that figure grew to more than 1000. That’s one in every fifteen ambulance paramedics in the country deciding to move on. And meanwhile, recruitment across the country has struggled to keep pace. Last year it fell. Brian, who currently works for the London Ambulance Service agreed to speak to us on condition of anonymity, so we’ve used an actor to voice his words. Brian: When I joined the job, it was very unusual for someone to leave the service other than through retirement over the last two or three years it escalated beyond belief. You just don’t enjoy going to work any more. And I never thought I’d ever say that. Adrian Goldberg: So why do you think so many people are leaving? Brian: It’s stressful. It’s demoralising. I think a lot of it is down to morale. Pay is a slight issue but to be fair it was never a financially rewarding job. It was about the personal reward. Now we are asked to work harder, work faster and you can get to the end of a 10 or 11 hour shift and you could go and see someone who has been stabbed and you are expected to perform at your best, when physically and mentally you’re not. Adrian Goldberg: So tell us about your typical day. Brian: I’ll start at 6:30 in the morning, do my vehicle check, and at 6:40 will get a call and that’ll be it. I’ll be out for twelve hours. When I first joined our utilisation rate was around forty, fifty per cent. Now it’s in the nineties. Adrian Goldberg: What does that mean? Brian: That means ninety per cent of the day you’re on a call. They haven’t got enough vehicles or staff to cope. It means were on the verge of breakdown. In London we will sometimes hear on the radio they are holding two hundred 999 calls because they haven’t got anyone to send. Adrian Goldberg: So you’ll hear on the radio that there might be two hundred 999 calls that are not being attended because all the ambulances are being used? Adrian Goldberg: So what does that excessive demand mean for patients? Well, to find out I went to Worcester Park in South London, and the home of Joyce and Debbie Clark, who in September 2012 went through a living nightmare after dialling 999 for an ambulance. Adrian Goldberg: Joyce’s daughter and Debbie’s sister Nicky Clarke was a diabetic and recuperating at home after a recent stay in hospital, but one night Debbie discovered that Nicky’s condition had taken a turn for the worse. Joyce: And she asked us to call for an ambulance. Debbie: And she said I really don’t feel well. Adrian Goldberg: So around midnight you rang the ambulance? Joyce: Spot on midnight I phoned. Adrian Goldberg: And what did they say? Joyce: They told me to wait outside to try and move the ambulance in, get her medicines ready and not to give her anything to eat or drink. Adrian Goldberg: But the ambulance didn’t show up. Debbie: So I went outside and I said you know it’s, like, ages since we called. You’d better from them again. So Mom came inside and you phoned them again. Adrian Goldberg: So roughly how long after the first call? Joyce: He said they didn’t have an ambulance available and they would send one of as soon as they had. Adrian Goldberg: From that point on her condition deteriorates? Debbie: It deteriorates again so in half an hour’s time again we phone a third time. Joyce: We have phoned a doctor meanwhile, and he said there wasn’t much point in him coming round if the ambulance is on its way. Adrian Goldberg: So from the first call to the ambulance to when the ambulance finally arrived, how long was that? Joyce: Well I thought it was an hour and a half they said it was an hour and twenty three minutes. We weren’t looking at our watches. Adrian Goldberg: So when the ambulance finally arrived what condition was Nicky in? Debbie: Well at that stage Nikki had just said to me that she was going now, she said I’m going now, I’m going now, and that’s the first thing she said to me for quite a while, for a good forty minutes. Adrian Goldberg: What did you understand her to mean? Debbie: I understood her to mean that she was giving up and that spirit was going to go, so I said to her you’re not going anywhere stay right here please stay right here. Adrian Goldberg: Paramedics eventually took Nikki to hospital but she had suffered a cardiac arrest from which she never recovered. Eleven days later, her life support was switched off and she died. At the subsequent inquest, the coroner recorded a narrative verdict. While the ambulance delays were mentioned, it couldn’t be said for certain that Nicky would have lived if an ambulance had arrived sooner. Joyce: As her mother, I believe that she would have certainly have had a better chance, but the thing is we’ll never know. I do feel…I’m sorry <crying>…I do feel she should have had that chance. She was forty nine, and she was far too young to go. It wasn’t fair. Adrian Goldberg: Dr Fionna Moore is the Medical Director at the London Ambulance Service. I wanted to ask her about the pressures on her staff and first about the case of Nicky Clark. Dr Fionna Moore: I am very familiar with that case and I met with Mrs Clark and Debbie who is Nicky sister, so I am really sorry that we didn’t provide a swifter response to Nikki on that night but we are continuing to try and ensure that we provide a swift response to the most seriously ill and injured patients. Adrian Goldberg: Why do you think that we’ll see in this exponential rise in the number of 999 calls? Dr Fionna Moore: Well the research that has been undertaken would suggest that we’ve seen a particular increase in the calls from patients who are very elderly, so over 81. We have also, however, seen an increase in the calls from the 21 to 30-year-old group and I think that reflects the sort of supermarket culture that we now have, so if you can buy a love of bread at Tesco’s at four in the morning, why can’t you access your healthcare when it’s convenient to you. Brian: You do get elderly patients call you because they are lonely or they have got no-one to care for them. And you can deal with that social side of the job, but often it’s just people who shouldn’t really call you. Adrian Goldberg: So what kind of unnecessary callouts have you attended? Brian: We got called out to a teenage boy and it said laceration to hand and serious bleeding and when we turned up he had a plaster on his finger and said “Oh I cut my finger yesterday can you just check it, make sure it’s alright?” I mean obviously I told him he shouldn’t be calling an ambulance out for that, and I had a word with his father but you know that’s an example of what we’re going to. It’s just non-stop. Adrian Goldberg: But there’s more to a paramedic’s increased workload than a deluge of inappropriate calls. It’s also calls by weaknesses – some real some perceived – elsewhere in the NHS. Patients who struggle to get an appointment with their GP [General Practitioner – family doctor] or who fear a long wait at a walk-in centre or A&E attempting to ring 999 instead. Others are referred by the 111 non-emergency service. Adrian Goldberg: Anthony Marsh, Chief Executive, West Midlands and East of England Ambulance Services and Chairman of the Association of Ambulance Chief Executives. But it is sometimes very difficult to determine exactly what is going on for that patient without actually seeing them. Trying to take information over the telephone for someone who is frightened or injured or unwell is actually quite difficult. So we do need to ensure that we get the balance right between providing appropriate services and not placing additional unnecessary risk for some patients. Adrian Goldberg: Now it can’t be easy for 999 call answerers trying to sift genuine emergencies from those where patients need lower-level treatment. But unnecessary callouts only up the pressure on paramedics and they have told us that there is something else making their life unnecessarily stressful too: targets. Ambulance trusts are supposed to reach seventy fie per cent of life-threatening so called red flag calls within eight minutes. If they fail, they can be fined by the Clinical Commissioning Groups within the NHS, who provide their funding. Stephen Sandford quit the London ambulance service eighteen months ago, partly as a result of the development of what he describes as a target-driven culture. Stephen Sandford: Well it became all about the targets. I mean, if you got somebody within the target time and they died, that was success. If you saved somebody’s life but you failed to get to the job within the target time that was viewed as a failure. You know it was just everything was stood on its head. I can understand why they – initially – they thought targets were a good idea but they are not. They are counter productive. Adrian Goldberg: Are you serious when you say that the organisation would be more pleased if you reached a patient within the target time even if that patient died, than if you reached a patient after the target time, but you saved the life of the patient? Adrian Goldberg: Now one question that’s entered my mind as we have been making this program is whether ambulance trusts are really making the best use of their resources. Here’s an example. The other day, I rode along with a paramedic in a 999 fast response vehicle to a bookshop here in central London where a man had passed out. Now, when we got there, a paramedic on a motorbike was already in attendance along with two more paramedics who had arrived by ambulance. So you’ve got three vehicles, four crew, so was that the appropriate level of help for a sick man? Or is it the sign of an organisation throwing too many resources at a single incident just to meet its Category A eight-minute target time. It is a question I put to Dr Fionna Moore, Medical Director of the London Ambulance Service. Dr Fionna Moore: What we may not know when the call initially comes in is just how sick that individual is. So if you have somebody who has collapsed in the street that could be a heart attack, it could be a cardiac arrest. And one of the reasons that our survival from help of hospital cardiac arrests is higher than anywhere else in the country is because we resource those calls very well. However, you are absolutely right that some calls get more resources than they possibly need and we are looking very closely at how we can reduce that. Historically, we used to be focused very much on the Category A targets. Now the Department of Health has widened and that to Clinical Performance Indicators, so there are a wider range of targets but you are absolutely correct that the one that is perhaps highest in our minds when we’re reporting matters back to our commissioners is the Category A target. Adrian Goldberg: And Anthony Marsh who runs Ambulance Trusts in both the West Midlands and the East of England, and who is also part of an NHS England review into emergency health care, says that maybe it’s time to rethink targets. Anthony Marsh: So I think that if you ask the public what they want from their ambulance service, it is for us to come quickly. So therefore, one of the largest determining factors is the speed by which we arrive and what we need to ensure is that those patients that really need a very rapid response receive one. But for many patients speed is only part of the outcome measures. Adrian Goldberg: Would you accept that in the past some managers have been over-fixated on meeting the performance times rather than being concerned about patient care? Anthony Marsh: Well I think there is a balance we need to ensure that we achieve that which we are funded to achieve. We have contracts in place with Clinical Commissioning Groups. We are funded on the basis of achieving certain response time targets for a certain number of cases each year. Adrian Goldberg: But the eight minutes is an arbitrary number isn’t it? Anthony Marsh: We are reviewing – be very, very clear – the Association of Ambulance Chief Executives have been very, very clear about looking at a broader range of outcome measures for our patients, some of whom won’t include – necessarily – a response within eight minutes. Adrian Goldberg: but any change has come too late for many ex-ambulance workers like Stephen Sandford. We’ve been told that many of his colleagues have quit to work in less stressful environments elsewhere in the NHS, such as GP’s surgeries. Or they go to the private sector, maybe to work in care homes. The Department of Work and Pensions is recruiting medics too, to carry out benefits assessments. So where does Stephen work now? Stephen: I’m still a medic, and I work for production companies mainly just looking after film crews, stunt people. Adrian Goldberg: How do you compare it to your previous job working for the ambulance service? Stephen: Well it’s gentler could pace. It’s easier work. I’m generally appreciated. Adrian Goldberg: The ambulance service might argue that, look, we need to initiate a process of change. Were you one of those people who is just innately resistant to change? Stephen: That is exactly what they did and will say, and my answer to it was always that not all change is good. And I think that if you look at what is happening to the ambulance service now, people are voting with their feet and leaving it in droves [high numbers]. I would say I was right and they were wrong. Adrian Goldberg: With paramedics quitting in increasing numbers, getting replacements isn’t as simple as it used to be in the past. London Ambulance Service now employs fewer paramedics than it did twelve month ago. Dr Fionna Moore is the Medical Director of the LAS. Adrian Goldberg: Is there a financial issue there though? Is government giving you enough money to hire the number of paramedics that you need to meet the demand? Dr Fionna Moore: Currently this is not a financial restraint. It is around training paramedics quickly enough. We have a very active recruitment campaign. However, there is a national shortage of paramedics, probably between 2500 and 3000 nationally and we’ve gone to Australia, where there is over-production of paramedics. They train 5500 thousand paramedics per year and they don’t have jobs for all those paramedics. Adrian Goldberg: Isn’t the real problem, though, that paramedics are being expected to do way too much work? You’ve got a smaller number of paramedics than you had twelve month ago, yet you are facing massively increased demand. Dr Fionna Moore: And that is something that we’re trying very hard to address. We’ve offered 400 posts to ambulance staff in the past year and we are looking to see how we can reduce the demand that faces us. Adrian Goldberg: Back at the London Ambulance control room in Waterloo, ambulance operations manager Craig Harman is showing me how demand can be reduced. The trust is hiring more medically qualified staff to triage or assess callers before an ambulance is sent. Craig Harman (Ambulance Operations Manager): Ten years ago we were probably providing what we would call ‘hear and treat’ advice to around two to three hundred patients a week. Even actually even a year ago it was probably only about 700 patients a week. That’s now 3500 patients a week but you know there is in an assumption there that the ambulance service will just come out to you. What we now need to do is say, actually, there are times when we won’t come because we don’t need to come and actually what you need to do is take some responsibility for your own health and seek care in the right place. Adrian Goldberg: But how risk-averse are you? Because if somebody rings up and says that they need an ambulance and then something terrible happens to that person, fingers will be pointed at you. Craig Harman: We use registered health professionals. All of our staff are paramedics. We’re introducing nurses into the service as well. So we are not triaging patients to say no. It’s about, do you need to see someone now, in which case we will be on your door quickly? Do we need to see you within an hour, or two hours, or three hours, or four hours or actually do we not need to come to you at all? So it’s not about saying no, it’s about pointing people in the right direction. Adrian Goldberg: So London Ambulance Service is five times more likely to refuse an ambulance request than a year ago thanks to better assessment. It’s a model that is being followed by other Trusts too. But what of the longer term future of the ambulance service and the problem of holding on to qualified staff? The Department of Health says that this year it has invested an extra twenty eight million pounds into the service in England. And they tell us that in the last four years more than seventeen hundred paramedics have been recruited, although that figure cover paramedics in hospitals and community health services too. Recent reviews of the ambulance service in Wales, Scotland and Northern Ireland have all proposed a greater role for paramedics in the future. NHS England is also looking at the role of the ambulance service as part of a broader review of emergency care. This too envisages an enhanced role for paramedics in treating patients in the field and, when possible, keeping them out of A&E departments. But does it make sense for the NHS to expect paramedics to do more when hundreds are already quitting because of the pressures of the job? Professor Jonathan Benger is the National Clinical Director for Urgent Care NHS England and part of the team currently reviewing emergency healthcare provision. Professor Jonathan Benger: I think I would contest your statement that retention is poor. Turnover of staff is inevitable in any large organisation and there will be variation in that turnover across the country and from place to place for a variety of reasons. Adrian Goldberg: Yeah I am slightly puzzled when you say that you don’t think it’s poor? I mean, the London Ambulance Service have told us that there is a shortage of around 2000 paramedics around the country. London itself lost 56 paramedics in the year 2010-2011. Last year it lost 223. Professor Jonathan Benger: Well I’m sure that is something that London Ambulance Service would wish to investigate in more detail. Adrian Goldberg: But isn’t that relevant to NHS England and your Urgent Care Review and the desire for paramedics to do even more intervention when they go out to visit patients? Professor Jonathan Benger: Well from the point of view of the Urgent Care Review, we are trying very hard to support paramedics and make sure that they can do their job effectively, which means giving them the skills and tools to do so and the support from healthcare community to achieve good patient outcomes. Adrian Goldberg: Is part of the answer simply to have more qualified paramedics? Professor Jonathan Benger: Through the review we are certainly looking at the number of paramedics available. We are in active discussions as to whether it would be appropriate to expand the paramedic workforce. I think that is quite likely outcome. Adrian Goldberg: So more paramedics are likely to be recruited at some point in the future to the ambulance service. If what I have seen during the making of this program is any guide that can’t come soon enough. Too many of them are already feeling under pressure now and giving up their jobs as a result. We have enormous expectations of the 999 service, and weakness elsewhere in the NHS are forcing more and more of us to use it. Reducing the number of emergency calls and sending ambulances to fewer of those who ring the emergency number is part of the solution. So too perhaps is a more flexible system of targets. One thing is clear. Until there is urgent and radical action to stem the flow of paramedics out of the ambulance service, we won’t have heard the last of this particular 999 emergency. This entry was posted in Human Factors/Ergonomics, Safety, systems thinking and tagged case studies, healthcare, safety, systems thinking. Bookmark the permalink. I am VERY interested in your workshop System but I see that you gave à good description above. I hope you suucceed in your project !!! Maybe I could participate ? You could count on à very thorough feedback.